Tintagel, 1881. 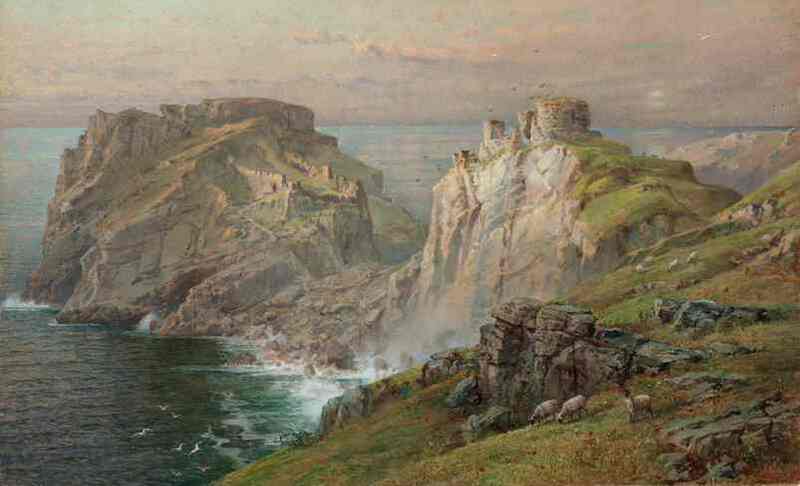 Large, masterful watercolor by William Trost Richards depicting castle ruins on the Cornwall coast of England, which Richards associated with the legends of King Arthur. Who needs to mess with oil paint and build big canvases when you can do this with water and paper? In a brilliant pairing, the National Academy Museum has mounted dual shows by artists who draw their greatest inspiration from water. There’s no need for a trip out of town to experience crashing waves, monumental waterfalls, and wide expanses of sea and sky done by one of America’s greatest watercolorists of all time and a celebrated 21st century painter. 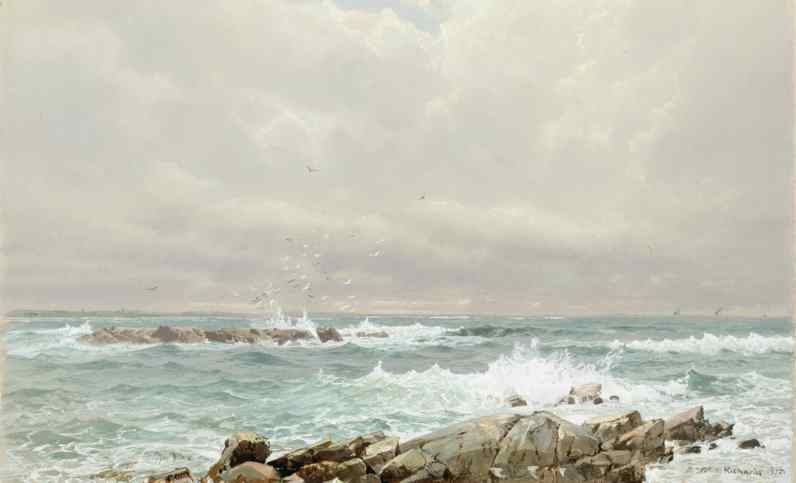 William Trost Richards: Visions of Land and Sea features 60 works from the Academy’s collection – early graphite sketches, oil paintings, and beautiful, grand, sweeping watercolor vistas that are some of the tiniest, most meticulous works you’ll see anywhere. Some are on display for the first time, which is remarkable considering that critics believe WTR to be among the greatest American landscape painters of the 19th century. Inspired by Ruskin and the Pre-Raphaelites early in his career, WTR began documenting the intricacies of the Wissahickon River paths near Germantown, on the outskirts of Philadelphia. He soon became part of the American watercolor movement that began making works that were just as grand, romantic, and full of transcendence as anything by Church or Bierstadt. Quite a feat, when you’re working on such a tiny scale. He spent years perfecting vistas of the ocean and sky from his home near Newport and on travels to the edges of the British Isles. Remarkably, he kept the horizon low to showcase the sky, all meticulously painted and built up from a ground of blue-gray wove paper. It’s remarkable how he evokes mood, rocks, night, dusk, and pale sky from that gray. Click here for more. Steir’s monumental Blue River (2005) – one of her celebrated Waterfall series. Steir’s monumental Blue River (2005) – one of her celebrated Waterfall series. The video shows its true scale. Pat Steir’s paintings, on the other hand, feature an opposite approach. Like Sam Francis or early post-Pop color-field painters, she pours, splatters, and drips her paint across canvases that seem a mile high and a block long. The masterwork on display at the Academy is Blue River, a virtual waterfall that’s just as mesmerizing as any of WTR’s watercolors, but done in bold, wide strokes on a larger-than-life canvas. Go this weekend and delight in the masterful scenery. Pat herself indulges in the joy right here. If you miss the Academy show, be sure to look for Pat’s Everlasting Waterfall hanging on the Fifth Floor of the Brooklyn Museum right next to Church. This entry was posted in Art, Museums, Nature and tagged art, Brooklyn, drawing, museums, nature, painting by mssusanb. Bookmark the permalink. I love the first two pieces pictured. Thanks! WTR is a true master! You can find a few more on the Academy’s website under Collections. He loved the sea, like you!